Pete warns Hank that a stray dog has invaded the ranch and is lurking inside the machine shed. 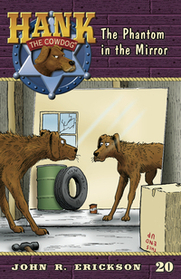 Naturally, Hank goes to investigate, and sure enough, he finds the Phantom Dog--in an old mirror stored in the machine shed. But then Drover looks into the same mirror and sees a “Handsome Prince.” Holy smokes, it appears that two dogs have invaded the ranch!